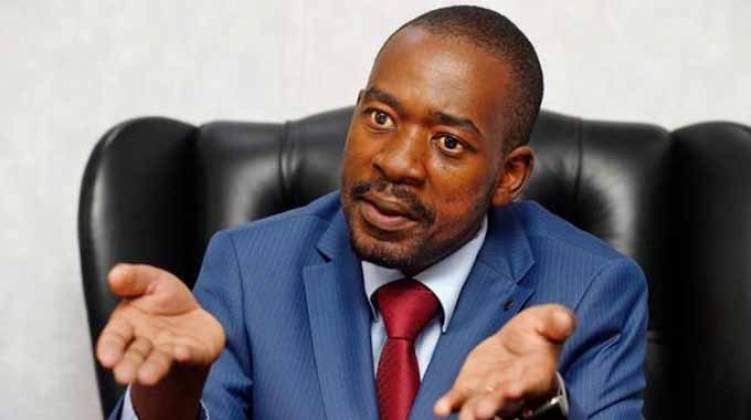 MDC leader Nelson Chamisa has demanded a "credible, neutral, and recognisable" mediator to present a plan for negotiations with President Emmerson Mnangagwa to end the worsening political and economic crises ravaging what was once Africa's most promising nation. Among his demands are mediation by a neutral third party recognisable to Sadc and the AU, including a requirement that all "prisoners of conscience" be freed, and that there be an immediate return to the barracks by the military. Chamisa said any continued military offensive would "take talks off the table." Charamba said the State House meeting on Wednesday boycotted by Chamisa resolved that "there should be no pre-conditions for dialogue," adding that negotiations would continue with the smaller parties even though political experts are of the view that these have no real power on the ground. But Chamisa's spokesperson Nkululeko Sibanda told the Daily News on Sunday on Friday that the ball is now firmly in Mnangagwa's court and it was up to the Zanu-PF leader to make or break the talks. While Mnangagwa wants a broader multi-party initiative, Chamisa - who disputes results of the July 30 polls - prefers a dual engagement on the grounds that he is the only one among all the other presidential elections who is contesting results of last year's elections. Charamba, who also doubles up as the deputy chief secretary to the President and Cabinet, said Chamisa's decision to skip the meeting over his demands was "self-defeating" and claimed it was a result of "foreigners whispering to him." But Chamisa's spokesperson said: "Why are they trying to dilute the problem? We cannot move on before we sit down. First, we must meet Mnangagwa, but eventually there must be inclusivity that brings all parties. The (MDC) president has no problem meeting with Mnangagwa any day." "Among other things, the convener has to be credible, neutral, and recognisable, he must be somebody who is recognisable to Sadc and the AU and that is not too much to demand for. Of course, if a local person meets those requirements, then fine, but we do not see what's not local about somebody from the Sadc region, what they are asking for is not usual, when you have a conflict you need someone from outside. We want Sadc and the AU as the guarantors of such talks," said Chamisa's spokesperson said. Charamba told the Daily News on Sunday that Chamisa cannot dictate terms when he decided not to attend last week's meeting held at State House which he claimed was convened by the National Peace and Reconciliation Commission chairperson Sello Nare. "The issue is not about the size of your constituency; that is why I spoke about the principle of parity. (Presidential candidate Brian) Mteki's intellect does not diminish because he didn't galvanise support on the ground. To the extent that he submitted his name for the elections means he has a view point on the nation," Charamba said. "We expect that soon after the president returns from Addis Ababa, he should be convening the inaugural Presidential Advisory Committee, which is part of the dialoguing process and you will see us meeting with a number of other interest groups to deepen this ethic of negotiations and consultations within our body politic, Chamisa cannot window shop forums. It was agreed that the convener should be in Zimbabwe," said Charamba referring to Mnangagwa's trip to the 32nd Ordinary Session of the Assembly of the AU in the Ethiopia capital on Friday. While Chamisa snubbed Mnangagwa's State meeting on Wednesday, the Zanu-PF leader returned the favour a day after. Charamba rejected widespread speculation that his boss' absence at the prayer breakfast to launch a national dialogue, called by the churches was to spite Chamisa, claiming instead the president had other commitments. Information gleaned from authoritative Zanu-PF officials revealed that the ruling party was distrustful of a western Scandinavian country that it claims has links to the MDC, sponsoring the church initiative. At the Thursday church meeting attended by government ministers, members of the opposition parties, and delegates from industry, the security sector, civil society, human-rights groups, trade unions, as well as international observers, including some ambassadors, the general secretary of the Zimbabwe Council of Churches (ZCC), Reverend Kenneth Mtata said national dialogue was the church's answer to the crisis. He said the ZCC, which hosted the meeting together with the Zimbabwe Catholic Bishops' Conference, the Evangelical Fellowship of Zimbabwe, and the Union for the Development of Apostolic Churches in Zimbabwe Africa had recognised that "the nation finds itself at the cross-roads," and said "the churches had made their voices louder regarding the urgency and necessity of a national dialogue. "There was an appetite across all sectors for dialogue," Mtata said. "I was overwhelmed: we got more than we expected. We can move forward with so much confidence." He said Mnangagwa, who had been expected, but pulled out at the last minute and was represented instead by the chair of the Zanu-PF party, Oppah Muchinguri-Kashiri, who read out a speech by the president saying that he was ready for dialogue, would be briefed personally later in February. Analysts predicted that eventually, Zanu-PF and MDC will reach a compromise, adding the present stand-off is largely posturing and political gamesmanship. "Eventually they will have to talk in order to unlock the political gridlock which has kept the country in limbo for the past seven months. Dialogue is a process which encompasses climbing down and up depending on the wider balance of forces," Mare told the daily News on Sunday. the process. Both sides are bringing their preconditions to the table, which is very normal. However, there is need for a mediator to help these parties to find each other and address issues like the military factor, human rights violations and the legitimacy question," said Mare. "Basically, all they could talk about would be how much power can be shared. Neither man, however, and neither party, has a realistic economic plan. The truth that both decline to share with the Zimbabwean people is that the economic foundations of the country are so corroded that no rescue plan can succeed without causing, for something like five years, very much more suffering than even now. No one has the political courage to say that in Zimbabwe right now," Chan told the Daily News on Sunday. "The faceoff between ED and Chamisa illustrates precisely why this process cannot be an exclusive political exercise, and must include civil society and other constituencies. A more inclusive process must also be facilitated by a credible team that understands process and can introduce a measure of accountability," Cham told the Daily News on Sunday. "We should not be surprised to see the old and young bull circling each other and sizing each other up, but both will have to do a lot more to convince Zimbabweans and others that these postures are anything more than a play to retain or assume power," said Pigou.